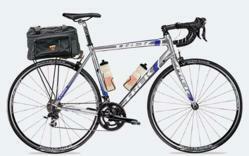 Pedaltours, the original New Zealand cycle touring firm, replaces their fleet of road cycles with Trek bikes. Even Lance Armstrong rides a Trek, so they must be good. To say the guides provided good service is like saying the temperature on the surface of the sun is warm. We are telling everyone we know that Pedaltours is the best bike touring company that we've ever travelled with. Pedaltours have been running fully guided cycling tours since 1985, so to stay ahead of the game they have decided to roll out a new fleet of cycles for their clients to enjoy. They have chosen the ‘Trek 2.1 H3’ as their perfect road bike, featuring 30 gears and carbon forks. This is just one reason why Pedaltours attracts a worldwide clientele who keep returning to experience their new destinations. Bicycling (the leading magazine for biking) chose Pedaltours for a good reason. Learn more at: pedaltours.co.nz/new-zealand-cycle-tours. 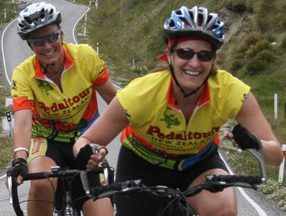 Their clients tour along with the Pedaltour guide through beautiful locations in the north and south island. With backup transport always available for when anyone needs a rest and following the perfect tour route planned by Pedaltours, you can see why their clients keep coming back for more. Pedaltours caters for beginners and experts alike, offering to tailor make the perfect touring experience. 8 Day Coromandel Peninsula – Covering Auckland, the Coromandel Peninsula, a farmstay and Rotorua. 8 Day Volcanoes – Covering Rotorua, Taupo, Tongariro National Park, a farmstay and Auckland. 15 Day Southern Alps – Covering Christchurch, Wanaka, Queenstown, Mount Cook and many other jaw dropping locations. 16 Day Southern Grand – Covering Picton, Nelson, Nelson Lakes National Park, the West Coast, Wanaka and Queenstown. Many more stunning NZ tours are available.